Webfoot Technologies Inc. - Raspberry Pi Games! Welcome to Webfoot's 2 Pi Feet! We are pleased to announce that we are offering most of our games on the Raspberry Pi free of charge. The first few games are already finished and the download links are listed below. To help support our efforts, you can purchase Webfoot games on other platforms such as the iPhone, Android, PC or Mac. Please visit our main web site by clicking here. How many games is Webfoot porting to the Raspberry Pi? We have over 100 games that we would like to port to the Pi. We will be releasing several games per week for as long as there is interest. That means we notice people posting the links and downloading the games. The game doesn't run, what should I do? It's probably because you need to increase the GPU memory split setting to 256MB run this game. To adjust the memory split setting from the Raspbian desktop, click Menu >Preferences > Raspberry Pi Configuration, select the Performance tab, enter the required memory amount (256) into "GPU Memory:", click OK, and reboot. To adjust the memory split setting from the Raspbian command line, enter "sudo raspi-config", go to "Advanced Options" > "Memory Split", enter 256, select OK, select Finish, and reboot. Will all the games be free of charge for Raspberry Pi users? All Pi games are free of charge to download and play. If you wish to make a small donation, there will be a donation button at www.WebfootGames.com/pi that will help to fund future ports and new games. Why are you offering your games for free on the Raspberry Pi? This is a bit of a personal decision. I felt it was time to give back to the community after a fantastic career. In addition, I've been teaching Computer Science at Lewis University, and as a teacher, I feel a strongly about offering something to the Pi community that will get kids excited about computers and excited about learning. The games all support keyboard and mouse input. We are looking at adding additional controller and gamepad support very soon. Can I apply to Lewis University and study video game programming there? Which Webfoot games will be ported to the Pi? All of them, except those restricted by licensing. For example, we don't own the license to "My Little Pony", so those games will not be ported as-is. If you don't own the license, does that mean those games will never be ported to the Pi? If we don't have licensing rights, but we own the game engine, it's possible we could release either the engine, or a version of the game with new artwork. So it is possible we might release games that are similar, depending on the circumstances. We do have really nice RPG and SPRG engines. We could possibly allow users to create their own art packs. There are possibilities here, but no decisions yet. We are looking to the community for feedback and level of interest. Which Raspberry Pi hardware is supported? Both the Raspberry Pi Model B and the Raspberry Pi 2 are supported. The Raspberry Pi Zero is not supported. Will you ever release any of your engines? It's highly probable that at some time, we will release some of our engines for educational purposes. Will you ever release the Webfoot engines documentation? We are currently working on a textbook that teaches video game programming in C++ using the various Webfoot engines, including some of the tech used in the Dragonball Z games. Stay tuned. 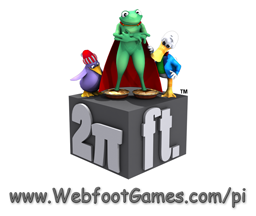 2 Pi Feet is a trademark of Webfoot Technologies, Inc. ALL RIGHTS RESERVED. © 1993-2019 Webfoot Technologies, Inc. ALL RIGHTS RESERVED.